The first Saturday of March means only one thing on my calender…The Karapoti Classic! This years edition was looking very fast indeed, with perfect weather and a relatively smooth course. My weapon of choice was my trusty Triton 29″/125mm. In 2015 I experimented with an ultralight 26″/114mm setup, which was great for the climbs, but felt rather knocked about on the rough, so it was back to the big wheel this year. We lined up on the the banks of the Akatarawa River, the traditional start line of the Karapoti. Having a unicycle means I can get across before the bikes, which I duly did. My crank choice was shorter than previous years where I used 145mm, and I was unsure whether I’d have the legs to push 125mm. The fears quickly dissipated as I spun my way up Karapoti Gorge, keeping up with my start group. 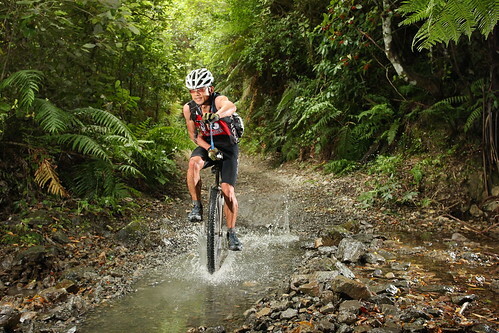 The biggest bummer was missing my race buddy Tim Armstrong, a local unicyclist from Upper Hutt. He’d done serious damage after coming off his unicycle a couple of months before- and ended up with a forearm held together by external fixation! Normally at this part of the race I’m doing my hardest to get as much time as possible on Tim. He’s a formidable climber, and closes the gap on the way up Deadwood. Nevertheless, my legs felt good, the cushy 29’er tyre and short cranks were smooth, and I was going as fast as ever. The entries were down this year, so there were fewer riders to get around on the climb up Deadwood. I remembered my *ding ding* bell, which I would ring as I passed people. I heard a guy scream as he ploughed down the first rocky section after the warm up climb….straight into me! Luckily the unicycle is virtually bomproof, but my left thigh was left bruised and bloodied. It didn’t slow me down but still hurts days later. After reaching Deadwood it was a nice spin over the rolling section at the top, then a fast dive into the Rock Garden. I was running 38 PSI in my tyre, which is firmer and bouncier than usual. In 2014 I came close to smashing the 2005 unicycle record (and possibly going under the magic 4hr mark), until a pinch flat took forever to fix! Never run 20 PSI at Karapoti. The Devils Staircase had been bulldozed and graded. I was both gutted and pleased at the same time. The original steep, boggy, fissured slippery slip was an iconic part of the Karapoti. At the same time, I knew I was on track to breaking the Karapoti Record, particularly if I could pick up a few minutes on the Devils Staircase. The climb now resembled Deadwood and Dopers- rideable for many mountainbikers. Over the top of the Devils Staircase and it was on to Big Ring Boulevard. This is supposedly the fastest part of the course, but on a unicycle it can be tough going- you are dodging rocks and and ruts and generally shaken to bits. This year, it was smooth and the 29″ Racing Ralph stuck like velcro, rolling over everything. By the time I hit Dopers Hill, I was confident I would break the unicycle record, barring something stupid, like crashing or puncturing. I cramped a little so eased off up the climb. The last section down the Gorge felt like I was flying- I came close to spinning out my 125’s. As we hit the Akatarawa river again, I was careful not to fall in like I usually do. Just had enough juice to remount and climb up to the finish line. It is always good at the end! Unfortunately, after checking the final time, I’d done 4hrs14min49secs! Three minutes slower than my 2005 record. I’m still scratching my head where those 3 minutes went- felt like my fastest Karapoti ever. Oh well, there is always next year. After getting back from Unicon 17, I realised that I have far more wheels than unicycle frames, and it was time to get a dedicated frame for my 700c standard racer. 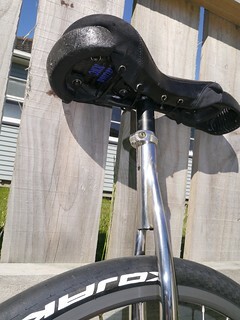 I had been using my 2008 Triton sponge frame, which is an amazing unicycle frame, but looks rather silly with a sleek racing wheel. It was designed for a 29’er mountainbike wheelset, and had enough clearance to drive a truck through. That notwithstanding, every time I wanted to go out for a ride, I’d be swapping wheels in the frame. I was originally planning a titanium road frame, but with Dmitry at Triton busy with bicycles over the 3yrs I had been pestering him, I had to find a local alternative. With three titanium unicycles and a Litespeed titanium road bike, you can probably guess I am a big fan of the grey metal. The great thing about titanium is that it is strong, corrosion resistant, doesn’t need painting, and still looks great many years later. It is also hard to work with, which is why there are few ti builders around. So with a bit of research I came across the new stainless steel tube sets being used on bicycles. Most of the bicycle tube manufacturers are making them, and they are perfect for custom bike frames. As yet, though, I am not aware of any stainless steel unicycles. Stainless steel doesn’t need painting, is light, strong, and, in my opinion, looks even better than titanium….I would be swapping grey metal for the shiny one. I looked up several frame builders in New Zealand, but settled on Anders Waiker at C3 (crucial custom cycles) in Petone, not far from where I live. It meant I could pop by during the week to sort out any design issues. He makes some beautiful mountainbike frames, so I was keen to work with him. Now you’d think a unicycle frame is a fairly straight forward thing to build, but once you add in curves it becomes a bit more complicated. Luckily, I could bring in my 700c wheel to slot into the frame to help with measurements, because my framebuilder is local. We had less clearance than expected, which meant that Anders had to crimp the legs slightly. On the other hand, the s-bend gives heaps of foot clearance, which is vital to anyone who races standard class. You want your feet as close to the frame as possible to maintain a high cadence, but you don’t want your feet hitting the frame either. An added bonus of bicycle tubing is you get the special things they do to bicycle tubes, such as double butting. These tubes are superlight! 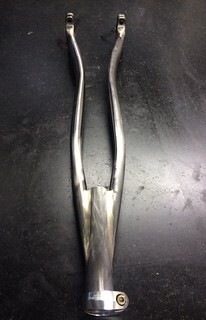 The fork was completed with a mirror finish (it took Anders 3 days to polish it! ), and sent off for painting. Unfortunately the painter had undergone hand surgery, so it took a couple of months to get it back. Anders topped the frame off with a very nice Thompson seat clamp. Total weight is 3.410kg with the above specs. I did some swapping of components (75mm nimbus cranks and 700x23c Rubino Pros), and swapping seats (my other Flatfish saddle uses lighter foam), which brought it down to 3.133kg. Not far off a sub-3kg unicycle, which should be achievable with a few component tweaks. So how does it ride? Unlike a bike, the frame has less influence of the ride than the wheel itself. The main requirements are stiffness, particularly on climbing and cornering, adequate clearance, and lightweight. I’m pleased to report the C3 stainless racer performs well on all three counts. I jammed it up the steepest hill I could find, which would normally flex any unicycle frame. Despite trying my hardest, there was no rub at all, even with the small clearance between the spokes and the frame. It corners like a dream, tracking exactly where I point it, even when driving hard into a turn. The s-bend stiffens the frame and gives oodles of room to get my feet close to the midline without rub. Not a big deal for most riders, but for anyone spinning over 160rpm, the last thing you want is to hit the frame with your foot. Weight-wise, the frame is comparable to the Tritons at a shade over 600g. Although the butted stainless steel tubes are lighter than titanium, the bearing holders on the Tritons are quite unique. As a result, the C3 frame is weighted toward the bearing holders, which gives it a lower centre of gravity- not a bad thing. Although I built the unicycle as a racing uni, most of the time…it won’t be. That means no excuse for wearing lycra either! Baggy shorts are not a good combination with unicycle frames, they tend to snag on the fork crown. 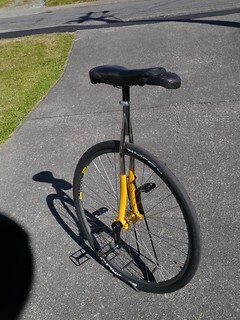 With the s-bend C-3 racer, I can ride my unicycle any time, anywhere, and not worry about ripping my shorts to bits. Oh yeah, did I mention it looks cool? I have wanted to write product reviews for Adventure Unicyclist for some time, after modifying, breaking, and throwing many parts away in frustration. I hope you find my views as a road unicyclist useful. While I try to be impartial…much of unicycling comes to personal preference. With my latest 36” Triton build, I thought this would be a good chance to look at some recent unicycle parts. I raced this rig at UNICON 16 in the Marathon, 100k, and 10km events, so the equipment was pushed pretty hard. I had ridden a standard KH 36” for about 4yrs. While it’s not a bad frame, there are several shortcomings, specific to aluminium rather than the KH. Namely, the frame looks fine for a few rides, but after numerous dings, crashes and corrosion, it looks terrible. Aluminium is comparably soft- I’ve stripped the thread on an old KH frame and several (non-KH) aluminium cranks. Not so with the titanium. It costs more, but what you get is virtually bombproof and will look like it came out of the factory many years later. Recently, my 2008 Triton 29” was scratched to bits against spikey pedals. With steel wool, it polished up nicely and you can’t tell it apart from a new one. If you want something cheap, light and stiff, and blue is your favourite colour, you can’t go past the KH frames. They work for most people, and they are constantly being updated. In terms of value for money- that is a difficult proposition…although the Triton costs more than twice the KH, it will last much longer. The 36” Triton disc is similar to the previous Tritons, but comes complete with disc tabs for a 180mm rotor. This was built to take the original SINZ Mt Uni Disc Brake cranks, but it is also compatible with the KH Spirit Disc brake. Magura brake bosses are included if you wish to run rim brakes. An added bonus of having disc tabs is that you can use different wheelsets on the same 36” frame. For someone short like me, it helps that the seatpost has been cut low. The frame is available in brushed bare metal titanium with big industrial ‘TRITON’ stickers down each fork leg. You’re given a spare set of stickers, but they do come off after hard use, so I leave them off after. The welds are clean and functional, almost on par with my $8000 Litespeed Archon road bike. The fork legs are low in profile to avoid rubbing your heel, but if you have fat thighs like me, you may still squish them against the fork crown, even though it has been cut off at an angle to minimise this. 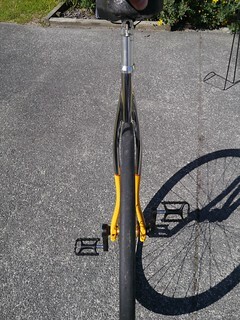 The original wheel consisted of a 2008 KH/Schlumpf hub built on a Nimbus Stealth Rim. Unfortunately the spokes were laced in a 4 cross pattern instead of 3 cross (*because there were no spokes of suitable length in NZ the time). As a result, the wheel was as flexible as a noodle, and resulted in significant brake rub. Despite truing and re-tensioning, I had to release the brake completely when doing the Lake Taupo Cycle Challenge last year. Added to my misery was the gorilla like strength required to pry a Nimbus Nightrider tyre off the rim. I’d had enough and decided to rebuild the wheel. 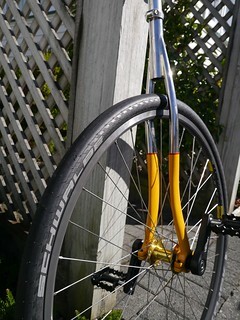 The new wheelset was built with the Nimbus II rim, using the same shaved Nightrider tyre I had previously. I replaced the heavy 36” inner tube with a clear 36” Foss Tube for a weight saving of another few hundred grams. This made for a stiffer, lighter, livelier wheel, but best of all, I no longer dreaded changing my tyre! The bead rolled off the rim easily, only needing gentle coaxing with a tyre lever; rather than the lubricated, grimacing, yelling, hernia popping experience I was used to. The disc was a mid-range set of Shimano Deore caliper paired to a Shimano XT 180mm rotor. It was cheap and functional, and the mechanics at my local bike shop are big fans due to their ease of servicing. They had more than adequate stopping power and modulation. I used a KH Starfighter extension on the brake lever. At NZ$40, it is a pretty expensive lump of not much aluminium, but looks cool and works well. Compared to the earlier KH plastic spooner, it should last longer and is more adjustable (and hence fit more styles of lever). I only wish it looked like the Millennium falcon rather than a wimpy Starfighter….I have to turn the brake towards my lever hand to reach it adequately. The disc rotor was bolted onto the new KH Spirit dual-hole cranks, in 125/150mm size. I was never a fan of dual-hole cranks- they look crude and inelegant. How wrong was I! The extra fiddlyness of setting up a disc brake, putting on a Schlumpf crank, and getting a torque lever in narrow places; was enough to convert me. I found the 125mm cranks much smoother, but moved back to 150mm for added power. All done with little more than an allen key. And then the unexpected happened- or perhaps the expected unexpected. After a few rides with my new setup, the Schlumpf hub broke! A spoke had ripped out of the flange on the hub. I found out later that the older KH/Schlumpf hubs require directional spoke lacing (the spoke holes are not symmetrical) – something my bike shop wasn’t aware of nor was it specified when I bought the original wheel four years ago. My wheel builder had laced the wheel the wrong way, which put too much tension on the flange and ripped a spoke through it. Luckily for me, Florian Schlumpf happened to be at UNICON, and I purchased a new hub to install in my unicycle, and Marco Vitale kindly rebuilt the wheel for me. Now, I have a new hub to review as well, which in theory, should work better as it has a longer axle and hence should have greater disc brake clearance. If only life were so simple. The new hub axle is 4mm longer than the old (152mm vs 148mm), but when I installed the cranks onto the hub, they sat further in on the ISIS splines. Now, instead of 1- 1.5mm clearance, I had zero clearance between the rotor bolts and the bearing caps of the Triton frame! I temporarily solved this issue by putting PVC tape on the spline- which pushed the crank out just enough that I have a few microns separating the rotor bolts (and myself) from oblivion should they ever come loose . I have since shaved the Triton bearing caps with an angle grinder, and I now have about 1mm clearance. The other clearance issue facing many disc users the gap between the inner fork leg and the Schlumpf dust cap. I believe this is a problem for the newer hubs because of some extra (bulkier) seals. However, it is not a problem on the Triton, which has oodles of inner clearance due to the thin tubing. I have used most editions of the KH Seat since they first came out. Coming from a bicycling background, I cannot see why unicycle seats are shaped like horse saddles. A seat should support your ischial tuberosities (the bony protuberances of your pelvis), and then not wedge against your crotch. I thought I’d try the Nimbus Flat, which is one of the newer, thinner seats available. When it arrived, I was disappointed at how fat it looked…it was as thick as my regular (shaved down) seats. It was thicker and wider up front than the Impact Naomi- my favourite seat (and the only one where I have not cut down the foam). The cover is stapled on, rather than relying on shoelaces to hold it together, which makes it difficult, if not unfeasible, to modify. For the aesthetically challenged, the seat cover looks like a pigeon shat on it. The only redeeming factor is that the grey colour matches Titanium. Comfort wise, it is passable, and definitely better than overstuffed horse saddles like the KH Freeride (although you can easily trim the foam). The wide front and upwards bend does get in the way, but until we get a flat, narrow, thin, seat, this is all you can expect. At 750g, the weight is comparable to the Impact Naomi and KH Slim saddles, but still three times heavier than an equivalent bicycle saddle. I used a KH T-Bar, which bolts onto the Nimbus saddle nicely. If you run this handlebar setup, get the Nimbus Flat (or other KH style seat). If you don’t use a KH T-Bar, get the Impact Naomi. How does the whole thing ride? My 36″ Triton Schlumpf rides pretty well for a geared unicycle. The wheel is stiff and it tracks well. 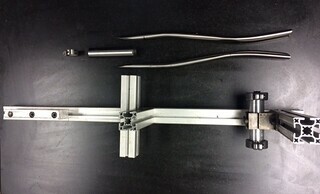 This is partly due to the new wheel build, and partly due to the very rigid Titanium fork legs. I had a few crashes, but the frame handled it all and I haven’t noticed a single scratch or dent. My favourite thing (despite the complexity) is the disc brake. It is so buttery smooth I found myself using it more than I am accustomed to. No sudden grabs, no disc rub, and strong enough to give me confidence to descend technical downhills in high gear. I think a disc brake is necessary if you are riding a Guni, simply because of the extra speed you have to keep in check. Shifting was good with the KH Spirit cranks- they flare out but I didn’t notice the extra Q-factor (probably because of the higher gear and lower cadences). They are about 150-200g lighter than the older KH Moment cranks, which I refuse to put on any unicycle because of the weight. The seat got in the way a little because of the bulk (compared to my cut down seats), but I completed the 100km Unicon race without too much discomfort. . The newer KH/Schlumpf hub is reinforced at the flange to prevent further breakages, and can now be laced in both directions, so that is a big plus. Aside from the rotor bolt clearance issue (really, the axle needs to be longer), it worked as well as the old hub. I didn’t notice any difference in shifting performance over the 2008 KH/Schlumpf hub. As with all Schlumpf hubs, it’s bloody heavy, and it makes the unicycle feel like a tank, but it’s the sacrifice we have to make for racing. So in summary- I love the frame, I like the disc, I can put up with the saddle, and the geared hub works as well as you can expect at this stage of development.